Mucuna pruriens, from the botanical family Fabaceae, commonly known as velvet bean or cowitch is a plant indigenous to India. Ayurvedic practitioners have used the seeds for centuries, in the management of Parkinson’s disease and nervous debility. The herb has also been used in formulations to control depression and improve mental alertness1. The long record of safe and effective use prompted detailed research into the phytochemistry and pharmacological effects of this plant. The endocarp of the beans were found to contain about 5% levodopa (L-dihydroxy-phenylalanine, L-DOPA) which is used in conventional medical practice in the treatment of Parkinson’s disease2. The plant is a slender climbing annual. The flowers are racemes with purplish corolla and the seeds are about 1 cm in diameter, bean shaped and white in color3. The seeds yield a red viscous oil which contains stearic, palmitic, myristic, arachidic, oleic and linoleic acids and a sterol. The alkaloids mucunine, mucunadine, prurienine and prurienidine are reported to have been isolated from the seeds. Besides a significant amount of L-DOPA (3-5), the seeds have also been found to contain tannins, sitosterol and lecithin3. 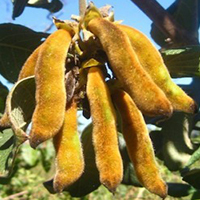 Suspension cultures of Mucuna pruriens are proven to biotransform L- tyrosine to L-DOPA4. Four indole-3-alkylamines and choline have been isolated from different parts of the plant3. Recent studies revealed that the levodopa content (dry weight) of a whole Mucuna bean is 4.02%, with the majority contained in the endocarp2. A 12-week study with 60 patients suffering from Parkinson’s disease evaluated the effectiveness of a stable standardized preparation made from the endocarp of M. pruriens beans in the treatment of the disease. An average daily dose of 22.5 grams was gradually increased to 45 grams of the extract per day at the end of 12 weeks. This treatment produced significant reduction in symptoms as determined using Unified parkinson’s Disease Rating Scale (UPDRS). The authors of this study concluded that the standardized extract of Mucuna pruriens offers an effective low cost approach to the management of Parkinson’s disease. As opposed to synthetic drugs, the combination of phytonutrients in the extract could contribute to its low toxicity and superior efficacy2. In addition to efficacy in the management of Parkinson’s disease, the seeds were found to reduce cholesterol and blood sugar levels in experimental models5. Mucuna pruriens has been prescribed as an aphrodisiac by Ayurvedic practitioners. A recent study revealed that the herb is useful in improving sexual performance in normal male animal models. A suspension of Mucuna pruriens seed powder in distilled water administered orally once a day for 7 days, at the level of 1 g/kg, to male rats produced significant improvement in sexual performance as compared to control rats receiving distilled water. The authors of this study concluded that the effects on mating behavior and sexual performance in the male rats involved in this study could be partially attributed to the androgenic effect of Mucuna pruriens and partially to the inhibition of hyperexcitation of the regulatory centers by the herb6. Androgenic effects are associated with increased testosterone production. Testosterone is known to play a key role in sperm cell production and immune functions and is often used to increase fertility and recovery. From a sports nutrition point of view, androgenic compounds are particularly promising since increased testosterone levels increase the deposition of protein in the muscles, leading to increased muscle mass and strength7. In view of the traditional use of the plant as a remedy for snake bites, one group of researchers recently investigated the effect of an aqueous extract of Mucuna pruriens on isolated smooth and skeletal muscle preparations. These studies revealed the capability of the extract to assist in the inhibition of cholinesterase and facilitate acetylcholine accumulation leading to reversal of neurotoxic effects8. The positive effects of Mucuna pruriens extract in improving mental alertness, probably through enhanced neuromuscular transmission. The combination of mental alertness improvement, L-Dopa production, aphrodisiac properties, cholesterol lowering action and nerve toning effects indicate the potential use of Mucuna pruriens extract in sports nutrition. The extract could be useful in strength building and to provide anabolic effects. The positive effects of the seed extract on neuromuscular transmission could help in honing the reflexes as well as in promoting muscular coordination thereby optimizing athletic performance. In light of these multifaceted effects, Mucuna pruriens extract is a valuable phytonutrient. Singh,.R.H., Nath.S.K., Behere.P.B. (1989) Depressive illness-a therapeutic evaluation with herbal drugs. Journal of Research in Ayurveda and Sidha; 1(1): 1-6. Manyam, B.V. et al. (1995). An Alternative Medicine treatment for Parkinson’s Disease: Results of a Multicenter Clinical Trial. The Journal of Alternative and Complementary Medicine, 1(3): 249-255. Mucuna pruriens. In Selected Medicinal plants of India, CHEMEXIL, (1992), 215. Akhtar, M.S. et al. (1990). Journal of the Pakistan Medical Association, 40(7): 147-50. Amin, K.M.Y. et al. (1996). Sexual function improving effect of Mucuna pruriens in sexually normal male rats. Fitoterapia, 67, 53-58. Aguiyi, J.C. et al. (1997) Effects of Mucuna pruriens seed extract on smooth and skeletal muscale preparations. Fitoterapia, 67, 366-370.